One aspect we typically don’t think about with regards to how coastal economies survive, is the longevity of the land itself. Beaches and other coastal areas are constantly changing under erosion, and if these places do not receive the proper protection, the land could disappear over time, taking with it many people’s livelihoods. This is where coral reefs come in. Last time, I discussed ecotourism, an important producer of revenue for many coastal economies surrounded by reefs. Another important economic service coral reefs provide coastal economies with is protection against erosion, although it’s not just economies at stake. 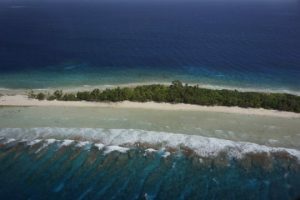 Somewhere upwards of 30 million people live on low coral islands and atolls, and the disappearance of these land masses would mean millions of people being uprooted from their homes4 , giving coastal protection programs even greater significance (Image 1). Image 1. Low-lying islands and reefs of Kwajalein Atoll in the Marshall Islands. It has been found that live corals, along with seagrasses and mangroves, protect coastal areas more than any single habitat or combination of habitats1. Corals specifically, have been shown to limit the impact of waves and storms on coastal areas1, protecting them in the long term. Even more good news, reefs near coastal areas can potentially reduce wave height by up to half a meter in some locations2. This reduction in wave height could significantly reduce erosion on a land mass over time. Although it does not completely put erosion to a stop, it extends the time that the area will be habitable by human populations living there and bringing in revenue from the resources off the coast. One large factor in whether it is worth maintaining reefs near coasts for the protection they provide is cost. Fortunately, natural defenses for the coast, such as reefs and mangroves, are two to five times cheaper than manmade breakwaters2. This is hugely important because no matter how effective reefs are in protecting coastal areas, and subsequently, their economies, if it is not financially feasible, it will not be done. Image 2. 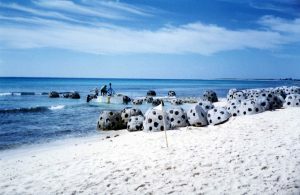 Artificial reefs being prepared to be stationed near the coast of Riviera Maya in Mexico. 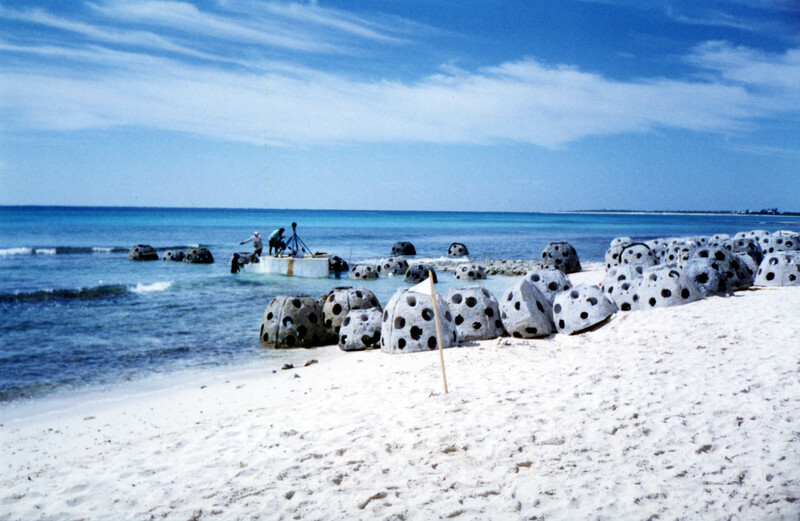 In areas particularly prone to large storms and hurricanes, even artificial reefs have been shown to effectively defend coastal areas, although currently, it is not known how to help these reefs last and support life long-term3 (Image 2). However, because studies have consistently shown that coral reefs provide significant shelter to coastal areas from frequent erosion, I think it is well worth it for coastal economies to invest in the protection of reefs, if not for the reefs’ sakes, but for their own. 1 Guannel, Greg, et al. “The power of three: coral reefs, seagrasses and mangroves protect coastal regions and increase their resilience.” PloS one 11.7 (2016): e0158094. 2 Narayan, Siddharth, et al. “The Effectiveness, Costs and Coastal Protection Benefits of Natural and Nature-Based Defences.” PloS one 11.5 (2016): e0154735. 3 Silva, Rodolfo, et al. “An artificial reef improves coastal protection and provides a base for coral recovery.” Journal of Coastal Research 75.sp1 (2016): 467-471. 4American Geophysical Union. 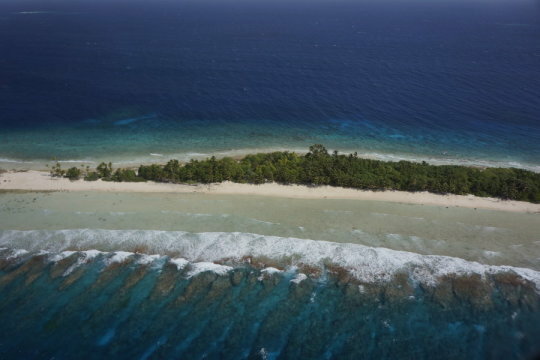 “Climate change reduces coral reefs’ ability to protect coasts.” ScienceDaily. ScienceDaily, 22 July 2015. This entry was posted in Uncategorized and tagged 2017, coastal, erosion, Marcella, protection. Bookmark the permalink.